Hi, my name is David Kaminer, owner and baker of Raleigh Street Bakery. At a very young age, I dedicated my life to creating and sharing good food with my family and my community. My most recent culinary adventures are with artisan bread baking. For the past 8 years I have had the honor of learning the trade from some of Colorado’s leading artisan bakers and opened Raleigh Street Bakery to continue to give back to my family and my community the best way I know how – bake them good bread. Raleigh Street Bakery is fulfilling my life-long dream, and I am thrilled to share it with you! As an artisan baker, I am proud to do what bakers have been doing for thousands of years – creating life out of flour, water and salt. Stop by and try a fresh slice for yourself! Want a taste? See the, Where to Find Us page to see where we will be. And just a little more about me… I grew up outside of Pittsburgh, Pennsylvania and graduated from Pennsylvania Institute of Culinary Arts in 2002. I jumped at the opportunity for an externship at the Broadmoor in Colorado Springs and moved to this beautiful state that same year. I’ve had amazing opportunities to grow and refine my culinary know-how at restaurants in Golden, Denver, and most recently, Boulder. I reside on Raleigh Street in north west Denver with my wife Missy and my two marvelous mutts, Olive and Caper. Thanks to the support, shovels and sweat of my invaluable friends, I broke ground on the Raleigh Street Bakery dream in August 2014 and sold my first loaf (honey wheat – thanks, Matthew and Mamata!) in January 2015. If you haven't tried Raleigh Street's bread, you don't know what you are missing. It's a great addition to any meal and adds the perfect layer of flavor. Try it, I promise you will not be sorry. 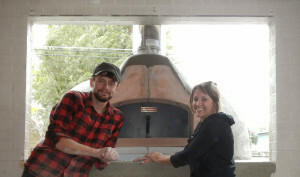 Dave bakes small batches in a brick oven with a love and understanding of the craft that has been lost for too long. Raleigh Street's bread is great for every meal of the day whether its toast in the morning, sandwich bread at lunch or a couple pieces to dip in a hearty stew at dinner. The bread never lasts long in our house! There's nothing better than sitting down with a glass of wine and having Raleigh Street bread to dip in oil and vinegar as a tasty lil' app before dinner. Check out five months-worth of work in a comfortable 30-seconds. Raleigh Street Bakery wouldn’t be possible without all the community support.